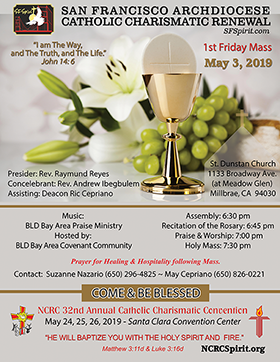 Throughout the year, San Francisco Archdiocese Charismatic Renewal sponsors a First Friday Mass that is held in different parishes across the Archdiocese. 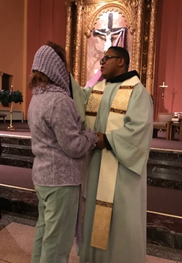 Personal healing ministry is offered after the Mass as well as refreshment and fellowship. All are welcome to attend. 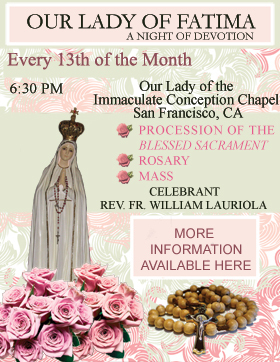 CCR First Friday Mass will be held January 4th at St. Paul of the Shipwreck in San Francisco, February 1st at St. Mark's Church in Belmont and March 1st at Corpus Christi Church in San Francisco. Members of St. Mark's Prayer Group who organized refreshments. 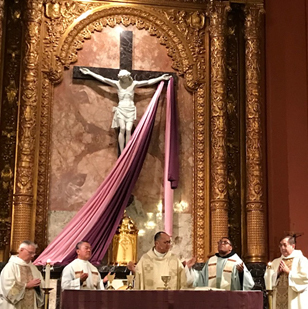 The conference focused on praying and fasting, sacrifice and learning â€œhow praise and a focus on Jesus Christ assists in breaking personal chains that bind us and others,â€� Rose Payan, renewal vice chair in charge of communications, told Catholic San Francisco. 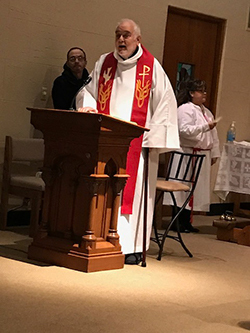 â€œFather Reyes encouraged conference participants not only to pray for themselves but also for others and for our church,â€� she said. 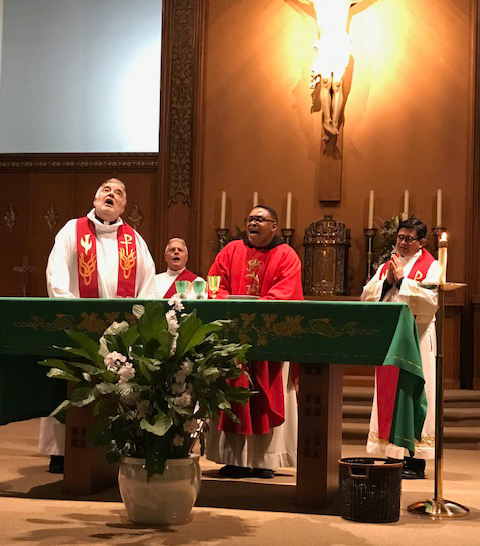 Assisting in the conference were additional priests, the Daughters of Carmel, renewal board members, and music groups including The Lordâ€™s Flock and SILOAM from St. Augustine Parish in South San Francisco, the Hispanic Music Ministry from St. Francis of Assisi Parish in East Palo Alto. 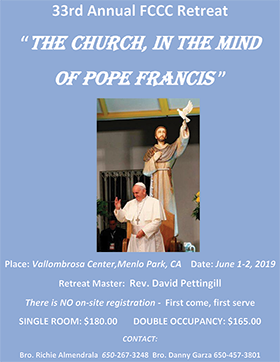 On August 11, 2018, Fr. 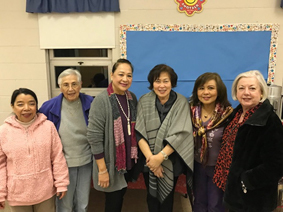 Raymund Reyes, San Francisco Archdiocese Liaison for the Catholic Charismatic Renewal held a leadership meeting of English, Spanish, and Filipino Charismatic Renewal Prayer Group Leaders. Participants had an opportunity to discuss the status of their groups, their needs and how they could be supported by the Archdiocese Charismatic Renewal Board. Fr. Ray updated the group on the new directive coming from the Holy See creating a new service body to support Charismatics worldwide entitled, Catholic Charismatic Renewal International Service, acronym CHARIS, a Greek word meaning "grace". 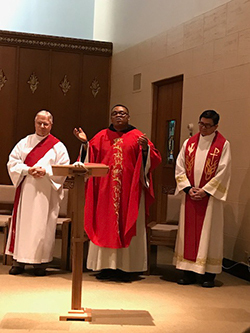 By Pentecost 2019, CHARIS will be under the Dicastery for Laity, Family and Life and will support unity in the Body of Christ. Leadership Conference pictures from the Charismatic Prayer Group Leaders day are found here. First Friday Masses is found here. To help all people come to know the love of God in their lives as demonstrated through our Lord, Jesus Christ. To help our brothers and sisters respond to God's love by loving God in return through a commitment to serve Christ and His Church. To assist them to listen and follow the movement of the Holy Spirit at work in their lives. 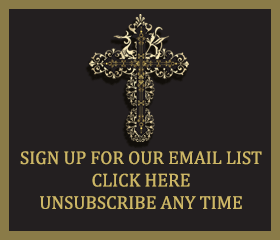 To help our brothers and sisters recognize the ministry that God has called them to, and accept the gifts that God desires to bestow upon them for His work in our Church and in our world. To lead them to a New Life offered to us by the Holy Spirit. "Today, millions of Catholics in more than 115 countries are involved in the Catholic Charismatic Renewal. What accounts for this dramatic growth? Those involved in the Renewal say that God has touched them in some profound way, releasing the power of the Holy Spirit in their lives. In the Catholic Charismatic Renewal, Catholics speak of being "baptized in the Holy Spirit." This statement does not change the Catholic teaching about the Sacrament of Baptism. It simply means that the power of the Spirit received in the Sacraments of Baptism and Confirmation often awaits a fuller "release" in the lives of many Christians." Click here to view a video about the History of the Charismatic Renewal in the Catholic Church.